Deforestation linked to palm oil has helped intensify massive forest fires in Indonesia and threatened endangered species – despite rules which should ensure deforestation for the global palm oil trade is limited. The evidence from an ongoing Greenpeace investigation comes as fires are finally dying down, thanks to heavy rain across the affected areas. The fires, which raged through Indonesia’s forest and peatlands for three months, were so vast that Indonesia emitted more carbon than China on several days this autumn – threatening global efforts to limit climate change. While companies and ministers try to apportion blame for what’s been described as the worst environmental disaster so far this century, oil palm saplings are already appearing among the ashes of the ruined forest. Greenpeace researchers have found evidence that some palm oil and paper firms are stepping in quickly to profit from the devastation and establish plantations in recently burnt areas. In theory, there are a wealth of safeguards in place to protect Indonesia’s forests. Many companies dealing in plantation commodities – growers, traders and consumer brands alike – have ‘no deforestation’ policies. Some 60% of the global palm oil trade comes under one of these policies. The Indonesian government has also laid down successive decrees to protect deep, carbon-rich peatlands. These include a moratorium in place since 2011 on allocating new areas of peatland for development, and a decree issued last month by President Joko Widodo ending all development on peat areas, even where already granted to a company for clearance. Together, these policies should be reducing deforestation, helping to maintain the peatlands that cover many low-lying areas of Indonesia and restricting the impact of the carbon bomb they represent. Fires on peatland release carbon dioxide locked in the ground over hundreds of years – with potentially devastating impacts on the climate. Yet figures show that deforestation is on the rise. Our research suggests ‘no deforestation’ commitments from both industry and government regularly being flouted, ignored and not enforced. In Central Kalimantan (part of Indonesian Borneo), for instance, the Indonesian government redrew deforestation moratorium boundaries so a palm oil company called PT Andalan Sukses Makmur (PT ASMR) was able to use a few thousand hectares for its palm oil growing operations. PT ASMR, a subsidiary of Bumitama Agri, was allocated a permit for over 9,000 hectares (equivalent to almost 13,000 football fields) of peatland adjacent to Tanjung Puting national park in 2012. The company’s own conservation value assessment identified the land as habitat for a number of protected or endangered species such as sun bears, ramin tree and orangutans. At the time, a good chunk of this land was covered by the 2011 moratorium. However, the government has repeatedly massaged the moratorium maps to exclude land handed over to plantation companies, and this is exactly what happened in this case: the boundaries were redrawn so the PT ASMR land no longer fell under the moratorium. Clearance at the site was continuing into the second half of this year, followed by fires that razed most of the forest that remained which was sandwiched between the developed areas. In August, Bumitama announced a new sustainability policy banning clearance on land designated as high conservation value, high carbon stock or on peatlands. It remains to be seen how effective this new policy will be, but it’s clear that the government’s moratorium is open to being manipulated. Our analysis suggests that between 2011 and 2013 nearly a fifth of deforestation occurred in areas covered by the moratorium. At the root of this is a lack of transparency about land usage and which companies have permission to develop which areas. 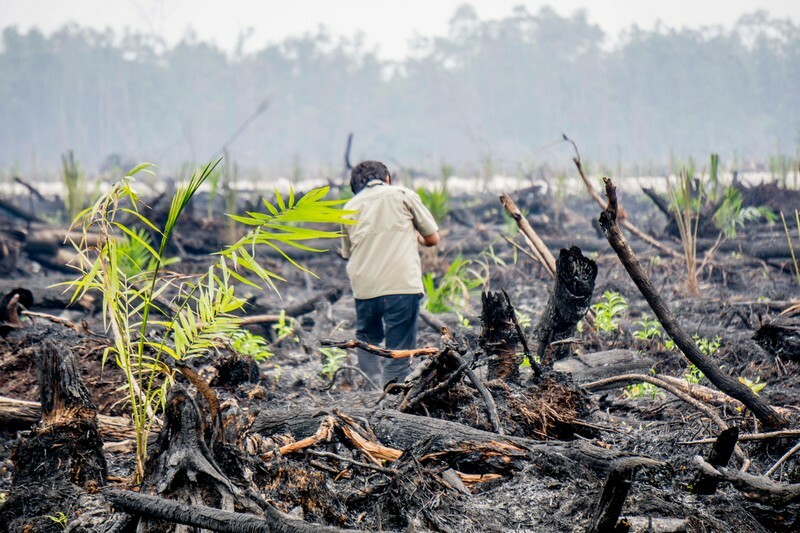 The Indonesian government has refused to release mapping data that would show what’s earmarked for industrial usage, and without that information enforcing the moratorium – as well as company ‘no deforestation’ policies – is all but impossible. Elsewhere on Borneo, in West Kalimantan, lies a patch (if you can call 100 km2 ‘a patch’) of land under the control of palm oil producer PT Bumi Sawit Sejahtera (PT BSS), a joint venture between Bumitama and a Malaysian palm oil trader, the IOI Group. IOI’s environmental assessment report states that 90% of this land was forested, and despite being classed as ‘degraded’ was still in possession of endangered primate species – orangutans, proboscis monkeys, and the Müller’s Bornean gibbon – as well as over seven km2 of deep peat. In early 2014, IOI announced a ‘no deforestation’ policy, which ruled out development of high conservation value, high carbon stock and peatland. IOI is also a member of the Roundtable on Sustainable Palm Oil (RSPO) whose raison d’etre is ensuring palm oil is produced sustainably. And yet clearance of the PT BSS land has continued, including areas identified as high conservation value or high carbon stock by IOI’s assessment. Already hit hard by fires in 2014, flames recently swept through much of this concession once again, and PT BSS is now facing government sanctions as a result. Perhaps the most damning evidence comes from PT Kusuma Alam Sari (PT KAS), part of the Alas Kusuma Group. Recently cleared deep peat on its land in West Kalimantan was ravaged by fire in July, and just weeks later investigators witnessed excavators preparing this burnt land for planting. Policies and decrees are only as good as the enforcement methods put in place to uphold them, and the evidence shows that for plantation agriculture in Indonesia these are lacking. Only a total, industry-wide ban on clearing forests and peatlands for plantation development will end the destruction, preventing the further loss of biodiversity and reducing Indonesia’s greenhouse gas emissions. And while companies and ministers try to apportion blame for what’s been described as the worst environmental disaster so far this century, oil palm saplings are already appearing among the ashes of the ruined forest.